In 2000, Asian expert and CIA advisor Chalmers Johnson warned in his much-publicized non-fiction book “Blowback” about the dangers threatening the US because of its global “base empire” – in vain. On September 11, 2001, Johnson’s cassandra visions became a terrible reality with the spectacular airplane raids on the twin towers of the New York World Trade Center and the Pentagon in Arlington. Instead of thinking better, the US, under the pretext of a “global war on terror”, displayed a tremendous actionism that exacerbated the fundamental evil – “imperial overstretching” to use the term historian Paul Kennedy instead of eliminating it. The extremely threatening situation has prompted a broad alliance of peace, environmental and human rights groups from around the world to call a “global campaign against US / NATO bases” to life. Finally, the United States and its NATO allies, together make more than 1,000 military bases in 170 countries, stir in the home countries of other peoples conflicts rather than to eliminate them, and surround them in a risk of fire, the territory of the “revisionist powers” China and Russia as well as the ” rogue “North Korea and Iran; Australia and Japan so far are considered informal NATO member states, while currently discussing the possibility of a military intervention of the recent “NATO Partners” Colombia in oil-rich neighbor, Venezuela. The war opponents see in the closure of all these military bases a necessary condition for the creation of a world in which international disputes are settled exclusively by means of diplomacy, instead of being exacerbated by armed force and artificially kept alive. 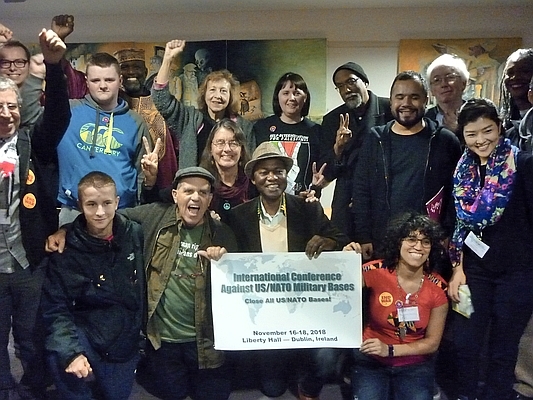 In order to deal adequately with the base issue and kick off the campaign against military bases, an international conference was held in Dublin from 16 to 18 November. Around 300 delegates from 35 countries attended the Fair City on the banks of the River Liffey. All five continents were represented. 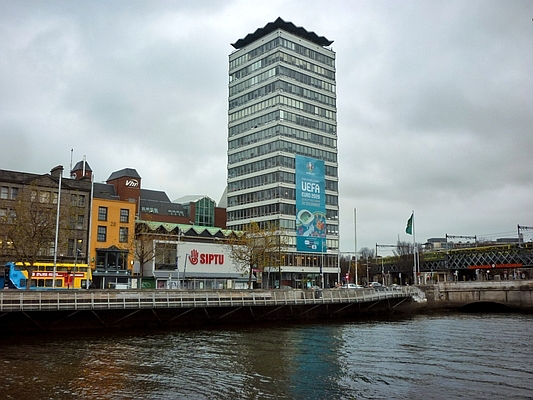 The choice for the Irish capital as venue resulted from the long-standing cooperation of the Peace and Neutrality Alliance (PANA) in Ireland with its ideological allies abroad, especially in the USA. Since the end of 2001, peace activists have been protesting against its use by the US military every Sunday before entering Shannon civilian airport on the Irish Atlantic coast. Over the last 17 years, more than three million American soldiers have made stops there on their way to war missions in Africa or Asia, or on their way home. Masses of American weapons and ammunition have been transported through Shannon Airport to the theaters of war east of the Greenwich Meridian. Also, some torture victims of the “extraordinary rendition” During the presidency of George W. Bush, the CIA were transported via the airport near Limerick to the special internment camp at the Guantánamo Bay Naval Base in Cuba or to the infamous “black sites” Langleys in Eastern Europe. The diligent observers of Shannon Watch have documented this by systematic listing and evaluation of the corresponding aircraft numbers. To protect the workers in the future, founded in 1913 Gewerbschaftsboß Larkin and Socialist James Connolly the Irish Citizen Army (ICA). In 1916, in the middle of the First World War, the ICA and the Irish Volunteers launched the Easter Rising against British rule. The matching Irish declaration of independence was previously secretly printed in the Liberty Hall. 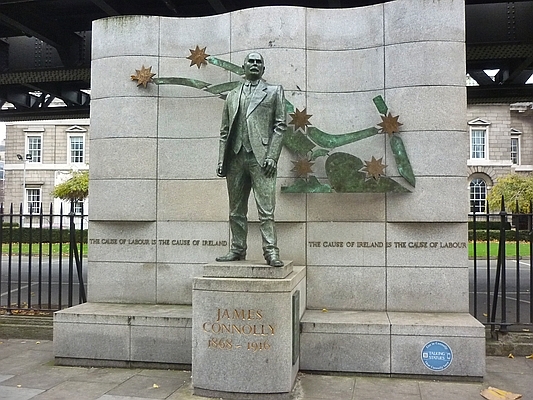 The leaders of the insurgents met in Liberty Hall on early Easter Monday before joining the General Post Office (GPO) in nearby Sackville Street (now O’Connell Street) with several hundred combatants. 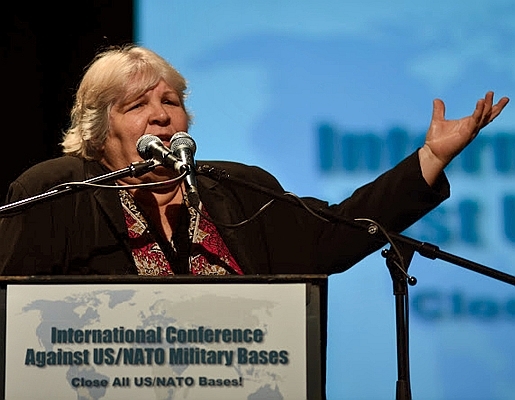 Consequently, the first event of the anti-NATO conference was a rally and a photo session. Banners and singing on the traffic island in the middle of O’Connell Street with the GPO in the background, which has become the world-famous, stoned symbol of the anti-colonial struggle over the past 100 years, created an impressive backdrop. Afterwards, an “international night” took place on Friday evening in the large meeting room of the Liberty Hall. Welcoming speeches were given by Ed Horgan of PANA, the Italian War Correspondent Fulvio Grimaldi, dr. Stelios Sofocli, Chairman of the Pan-Cypriot Peace Council, Silvio Platero, Chairman of the Cuban Movement for Peace and Sovereignty of the Nation (MOVPAZ), Lukas Wirl from the German section of the International Lawyers against Nuclear Arms (IALANA), as well as Clare Daly. 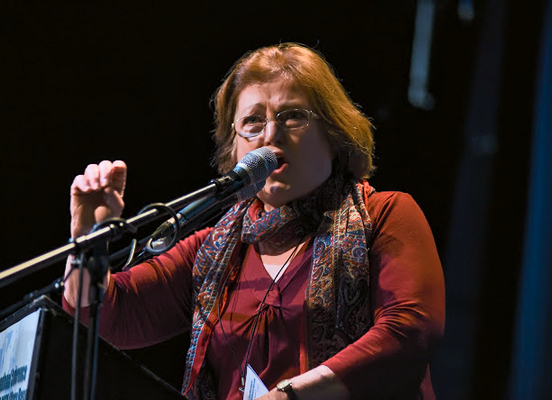 The fiery speech of independent left MPs in the Irish House of Commons (Dáil) was particularly well received by the delegates, not only because Daly had started them with a witty quote from Dublin dramatist and drunkard Brendan Behan, but probably also because the former SIPTU works council member the 2014 arrest of police for attempting to control foreign special purpose machines on the Shannon tarmac for illegal dangerous goods is considered a courageous hero of the Irish peace movement. On Saturday and Sunday informative and revealing panel discussions on militarism, nuclear weapons and military bases, impact of military bases on environment and health, Central and South America / Guantánamo, Asia Pacific / US Security Policy reorientation to Asia / Okinawa, Middle East / US NATO plan, Europe / NATO enlargement and Africa / AFRICOM. Practitioners from virtually every corner of the world came to witness the negative consequences of living near foreign military bases. Among other things, the little-known fact of the contamination of groundwater near all more than 400 military bases in the USA has been addressed by perfluorooctonic acid, which is regarded as highly carcinogenic even in microscopically small amounts. About the possible, Excessive consequences for humans and the environment from US bases abroad are largely a mantle of silence. This is ensured by the State of Forces Agreements (SOFA), which the Pentagon has agreed with the host countries. The first US military base abroad is Guantánamo Bay, whose lease was agreed in 1903 between Havana and Washington. The Cuban government and the people of the island now regard the agreement as invalid. This was made clear at the Dublin conference. Aledio Guevara, daughter of the famous Argentine revolutionary leader Ernesto “Che” Guevara, clearly. In the coming year, the Cubans want a big event with international participation under the motto “Close Guantánamo now!” hold. 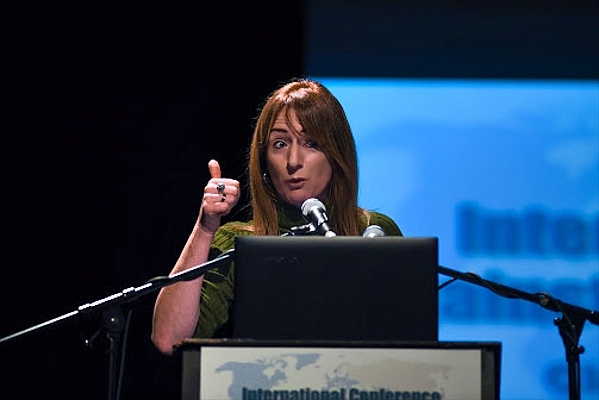 Equally engaged was Nobel Peace Prize winner Mairéad Maguire, who pointed to the fate of Julian Assange with obvious passion at the conference. For more than six years, the Wikileaks founder is stuck in fear of reprisals in the Ecuadorian embassy in London. On 15 November, for the first time the existence of a secret charge against Assange before the Eastern District Court of Virginia was officially known. After the eventual extradition, the Americans want to prosecute the native Australian for espionage only because he has published secret documents on the Internet about the sometimes illegal machinations of the State Department and the US military. In the ongoing martyrdom of Assange, Maguire rightly sees a US and British frontal attack on traditional press freedom in Western industrial nations. just because he has published secret documents on the Internet about the sometimes illegal machinations of the State Department and the US military. In the ongoing martyrdom of Assange, Maguire rightly sees a US and British frontal attack on traditional press freedom in Western industrial nations. just because he has published secret documents on the Internet about the sometimes illegal machinations of the State Department and the US military. In the ongoing martyrdom of Assange, Maguire rightly sees a US and British frontal attack on traditional press freedom in Western industrial nations. 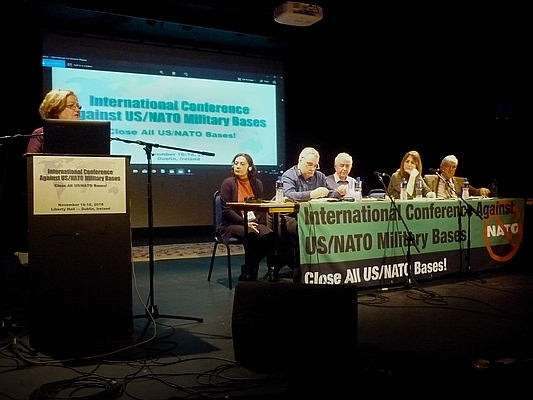 The Anti-NATO Base Conference in Dublin took place one week after an event in France, attended by key dignitaries from North America and Europe, to commemorate the end of the First World War 100 years ago. Yet, the vociferous postulate of French President Emmanuel Macron that there was a need to create a “real EU army” proved how little Europe’s current political class has been in slaughtering millions of people on the Old Continent between 1914 and 1918 and learned in 1939 and 1945. In Ireland, many people are concerned about the Dublin government’s decision to participate in PESCO (Permanent Structured Cooperation), which is intended as an intermediate to the EU army. 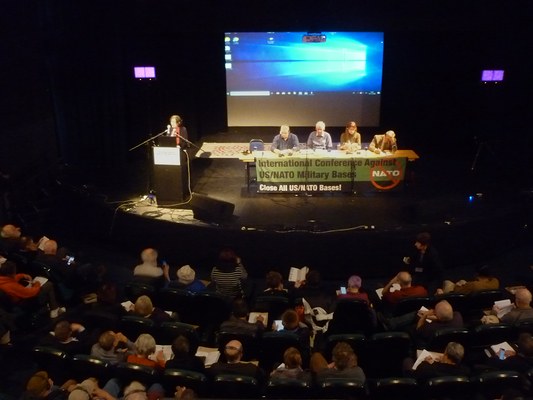 So it was really disappointing, if not surprising, how little press response there was to the Liberty Hall conference. 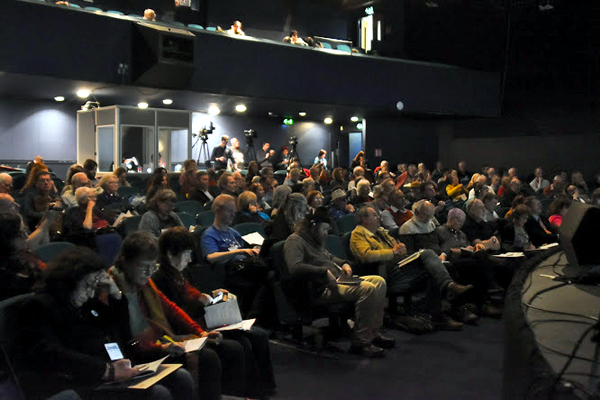 In the private and state-run Irish media, apart from a message in the Belfast Newsletter – the mailbox of the Eurosceptic, Procritical Democratic Unionist Party (DUP) of Northern Ireland – the conference has not been mentioned in any way. Pearl Harbor is a lagoon harbor on the island of Oahu, Hawaii, west of Honolulu. It has been long visited by the Naval fleet of the United States, before it was acquired from the Hawaiian Kingdom by the U.S. with the signing of the Reciprocity Treaty of 1875.